Nicknamed “Air Race”, the new Breitling commercial brings together one of the finest specimens of P-51 Mustang (specially prepared for Breitling), the legendary F4U Corsair and the spectacular landscape of Utah’s Bonneville Salt Flats. 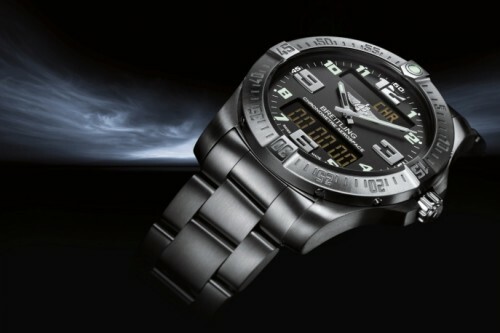 Added to that is an attractive casting and a typical Breitling touch of humor to discover below. 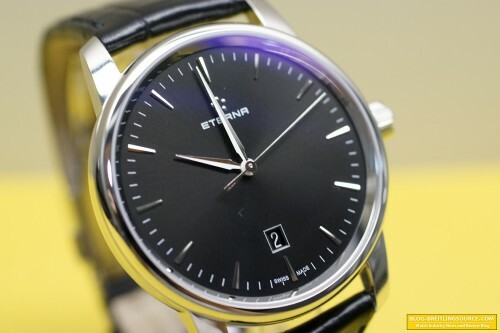 Watch discount retailers have been liquidating these Eterna Soleure automatics like mad for the past couple years, and I have had my eye on them since they started in around $1100 and have been dropping steadily. Now they can be had for around $800 or a touch less depending on where you go. 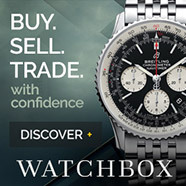 An absolutely smashing deal considering what a beauty this watch is. Make no mistake, while this watch is priced in Hamilton Territory, case and dial work are far above and compete with Swiss brands matching the true MSRP of this watch, which is around $3000. As you can see, my version here is the black dial with silver applied indices. There is also a arabic numerals version as well, but I prefer this one due to the cleaner, more classy look. Seems to suit this watch better. I actually have a moonphase version of the Eterna Soleure with the silver sunburst style dial. I like that dial as well but now having both of them I think if I had to choose one, I’d take the black. You can clearly see the blue tinge of the AR coating as well in the above photo. The watch is housed in a beautifully crafted 316L three-piece stainless steel case, measuring 42mm in diameter and 9.5mm in thickness. The casework is fantastic and at street prices around $800-900, it is an incredible deal. The machining and polishing are top notch. Indices and hands are beautifully crafted and polished as well, giving the watch a quality appearance. The date is located at 6 o’clock, and is quickset. The case back is mostly polished with some finely sandblasted edges, and solid steel not revealing the Selitta SW-200 movement beneath. 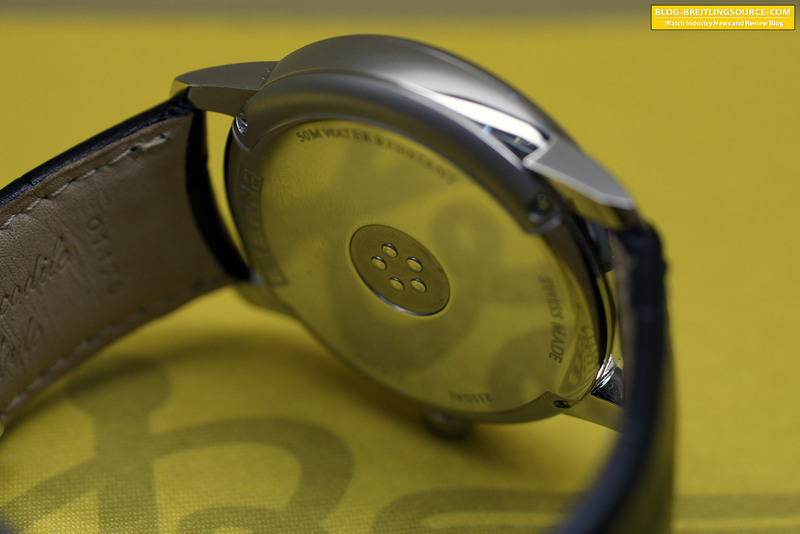 I had a photo of the caseback opened on another example of this watch but I seem to have misplaced it. It is a nicely finished version of the movement with a signed and jeweled rotor. The Selitta SW-200 is a near exact reproduction of the ETA 2824 movement, produced by Selitta to service the needs of the Swiss Watch industry since ETA’s announcement to stop selling its movements outside the Swatch Group. 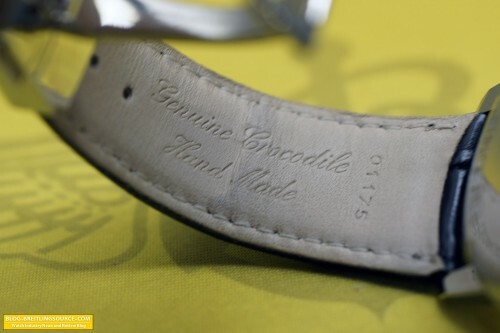 The strap is a wonderfully clean and immaculately hand-crafted Genuine Crocodile affair, with lug attachment side curved to fit the contours of the watch. I love watch straps that have curved ends, but they are hard to find replacements for without paying relatively high prices. That’s one of the things about watches like these that are highly discounted is the straps are often not discounted as much as they should be. Here’s a shot of the cool Stainless steel deployant that Eterna uses. 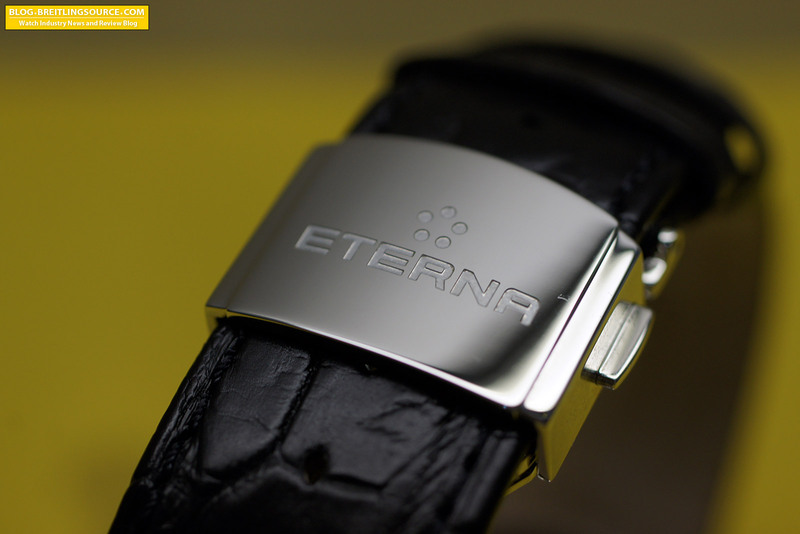 It is a single butterfly, push-button style deployant with the Eterna logo deeply machined into it. I really quite like it as its easy to use and very comfortable, something that can’t be said for all deployants. 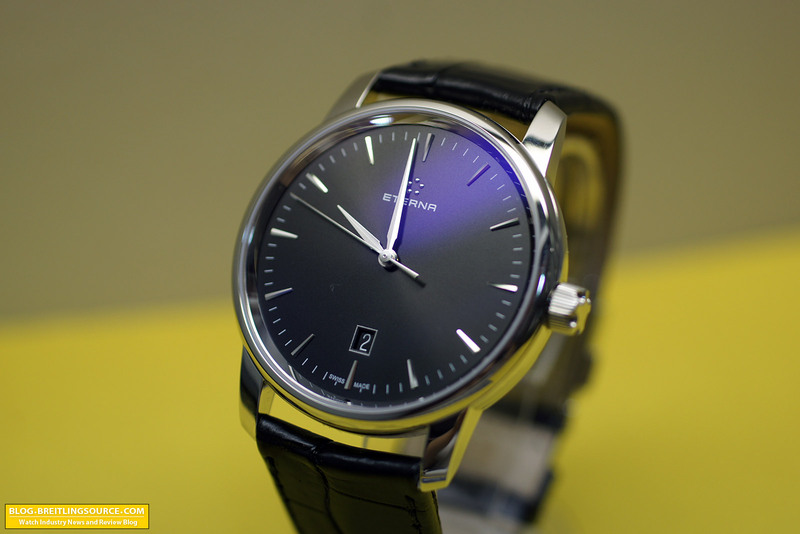 I saved the best for last – a wrist shot of the 42mm Eterna Soleure on my 6.75″ wrist. It actually shows a bit smaller in the photo in relation to my wrist than it does in real life. I’ve had trouble getting accurate looking wrist shots depending on the type of lens I use. Most either make the watch look too big, or too small. Nevertheless, its always good to see what it looks like on the wrist. 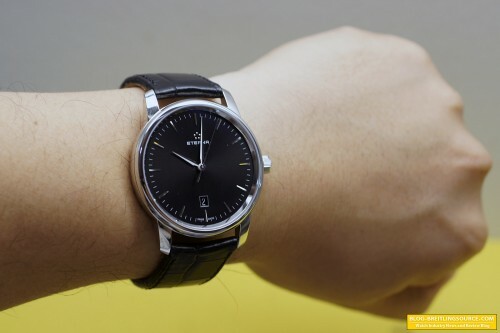 I would say that it wears in-line with other 42mm watches. Hope you enjoyed the review! A new look for pilots’ favorite instrument. Breitling has redesigned its electronic multifunction Aerospace chronograph in a style that is even more powerful and dynamic, yet as technical as ever. A highly professional design combined with peerless functionality. First launched in 1985, the Aerospace has asserted itself as one of the stellar models in the Breitling Professional range. Equipped with a chronometer-certified SuperQuartz™ movement, ten times more accurate than standard quartz, it is distinguished by its particularly simple and logical control system. Simply rotating, pressing or pulling out the crown is enough to operate the entire set of functions that are all especially useful to aviators: 1/100th of a second chronograph, countdown timer, 2nd timezone, alarm, audible time signal (minute repeater) and calendar. The Aerospace also features an extremely effective and NVG-compatible display backlighting system. Breitling now combines this peerless precision, readability and functionality with a new design clearly cut out for great accomplishments. Its distinctive features include a slightly larger diameter, an engraved bezel with integrated rider-tabs, redesigned hands and numerals, and a beveled glass. The light yet sturdy case in titanium – a favorite metal in the field of aeronautics – is entirely satin-brushed, while its back bears a conversion scales for Anglo-Saxon and metric measurements. The new Aerospace Evo is available with three dials – black, blue or grey – and comes fitted with a leather, crocodile leather or rubber strap or a titanium bracelet. It may also be equipped with an optional auxiliary Co-Pilot electronic module integrated into the metal bracelet. Aerospace Evo: a new look for every mission. Check it – reviewed the Hamilton Below Zero, which is Hamilton’s interpretation of the instrument watch made popular by Bell & Ross. It is one of the better made cases from Hamilton, but still suffers from some design weaknesses that are common in entry level luxury watches. Still, a great effort and a generally nice watch to wear and experience.